Update: The kickstarter is live! 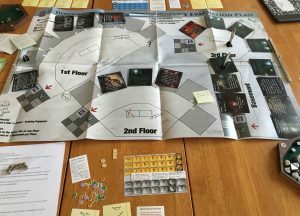 “Coma Ward” the game is an upcoming Kickstarter effort that will launch this month from Everything Epic. I previously mentioned “Coma Ward” when I got a somewhat mysterious envelope at Gencon 2017. A few weeks later, this interesting package arrived at my door. I give EE credit from some excellent trade dress on this game. 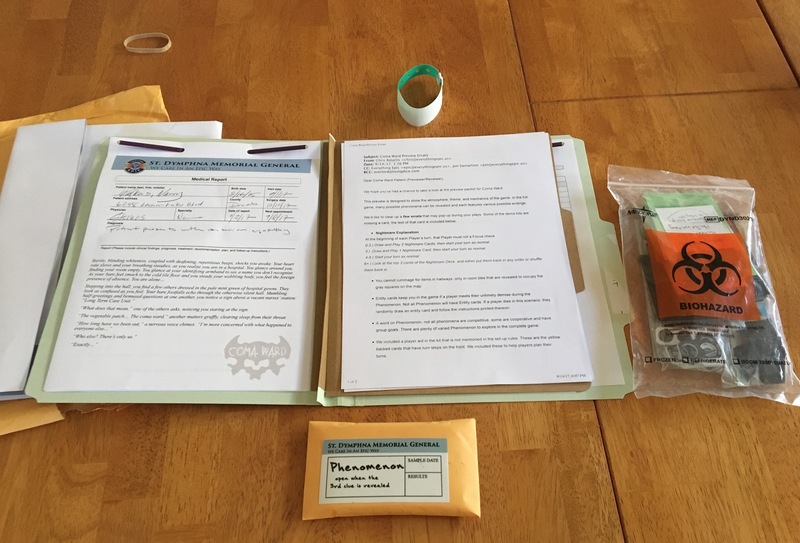 The game came as a medical file folder, complete with a hospital wristband and a biohazard bag for the components! Before I continue, I should mention this is a prototype of the final game and I have no idea what that final version will look like. Hence my choice of “first look” rather than review for the title. Consider this more of a play report rather than a full review. “Coma Ward’s” premise is the players wake up in the coma ward of Saint Dymphna’s Hospital. (Saint Dymphna is the patron saint of the mentally ill. I had to look it up.) Each player begins with nothing except their wits and a hospital gown. The goal is simple: get out of the hospital alive. Here is a shot of the game in progress. For this next bit, it might help to have the image above open in a separate window, expanded to full size. It makes the following gameplay explanation a bit clearer. The card in the lower-center is your character’s statistics. Health, strength, and dexterity cover the physical elements and you will note that as you take damage they decrease in unison. In the center of my player card is a white strip called the “neurosis” card. You have abilities that change depending on your physical and mental state that you may call on. In case you have not figured it out, the characters are not really…sane in this game. You are never really sure if what you are doing is real or just in your head. The lower section is “focus” and “terror.” I will speak more on those in a moment. “Suspense” are exploding dice. So if you roll a “4” you get to reroll that die and an additional die. Should you get another “4” as part of the reroll the rolling continues until you stop rolling “4” or you succeed. It means that you can attempt anything, even if you only have one die to roll. During my playtest, this happened more than once. Players move around the board exploring rooms. As each room is revealed, the player makes a “focus” check. Success on the focus roll means you get an item. 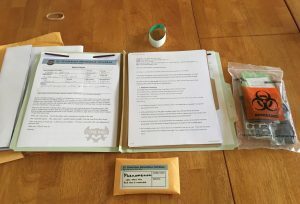 Some grant benefits like speed, healing or weapons while others are “clues.” Once you find three clues the “Phenomenon” phase of the game begins and the game changes. If you fail then you get a “hallucination” card that may be beneficial or harmful. Another player reads the card and offers you a choice, which you do not know if your choice is beneficial or harmful until after you choose. Choices often involve making a roll of some kind. Sometimes a successful roll prevents damage or you receive an item. Other times you see something no human should see and you earn “terror.” “Terror” is a fun mechanic because any “terror” over five comes off your physical health. You can be scared to death during Coma Ward! “Focus” is your ability to use your mind to make rational, cautious decisions. “Terror” reduces your higher-thought processes but provides adrenaline to fuel your strength and speed. I spent almost the entire game “terrored” out of my mind. It meant I was miserable at finding items but good at physical tasks. During this phase of the game, players may attack each other with the goal of stealing items or simply hurting the other person. We took advantage of the stealing rules several times to grab better equipment from each other. Combat is quite simple. Roll your strength dice (five in my case) plus any weapons against the strength and any weapons of your opponents. Weapons add dice. I was a dangerous patient with my syringe and bedpan. I fought successfully several times. Though an IV stand wielded by another player defeated me. After much exploring (and increasing terror), we uncovered the third clue and the “Phenomenon” phase began. Hidden in a separate, sealed envelope were the cards and implements for this phase. It included the epilogue card with the final result and unique, secret goals for each player. After drawing a goal, each player had to achieve the goal in order to win the game. In the final version there will be many options for this, but in this prototype game, we only had a few. I discovered I was an angel missing his wings and needed to get to an operating room to re-attach them and then jump off the roof of the building to fly to heaven. As part of this final phase, a new deck came into use. The “nightmare” deck added additional monsters and obstacles to the final tasks. By a bit of amazing luck, I stood in the correct room as I drew my objective. With minimal effort, I made it off the building and flew to heaven…only to discover…. Spoiler on that particular outcome, so I will not ruin it. Flying to heaven is a happy ending. Just accept it. 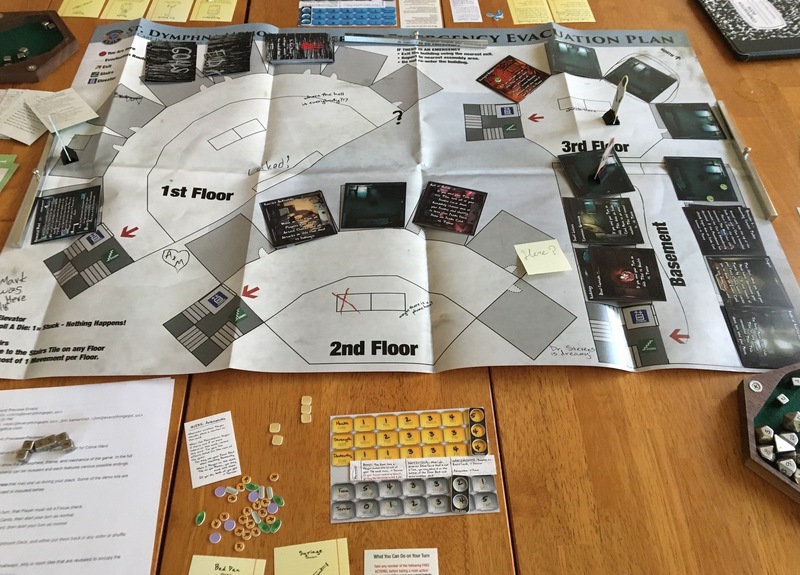 “Coma Ward” is a fun game with a lot of promise, but I would be negligent if I did not mention its resemblance to “Betrayal at House on the Hill.” “Betrayal” and I have a mixed history. I consider it one of the most tragic disasters in all of board gaming. The game holds such promise, but the mechanics rip all strategy from the game. Acquiring equipment early game is blind luck and no one ever gives it up because the haunt may be every man for himself. CW lets you steal from each other. Additionally, BaHotH has no carry limit, which “Coma Ward” uses. CW only allows you to carry one item per point of strength and if your strength drops, so does an item. It kept the end game a much more equal affair. “Coma Ward” is mechanically well designed, balanced and has a great insane asylum aesthetic. The Kickstarter will start in a few days and I will update you when it goes online. RPGSeek.com–Human Indexed Search Engine and Directory Launches!